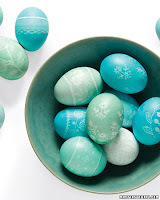 Need some really cute and neat egg decorating ideas? I do so I stopped by Martha Stewart to find something unique. These lace eggs are really neat and look like fun. Cut lace into strips long enough to wrap around eggs and still have extra to form a sash for holding. Wrap eggs, securing lace with rubber bands. Dye eggs according to dye package instructions. Lift out, cut off rubber bands, and unwrap lace. Let dry on foam board fitted with flathead pins.